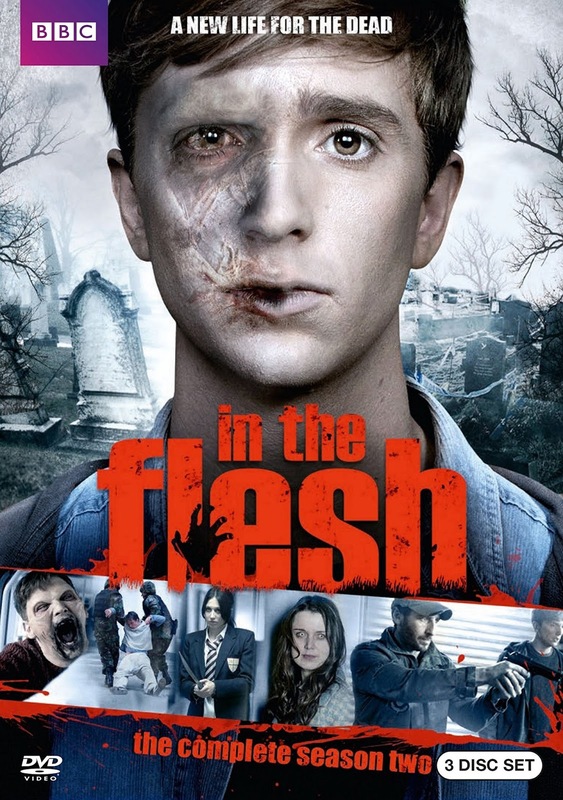 The first season of In The Flesh was a pretty novel bit of television. More than your typical zombie TV show, it was based around a pretty unique premise - what if zombies could be "cured" after a zombie expedition. And while originally envisioned as a limited mini-series, the show was eventually confirmed for a second, longer season to expand on the story. Admittedly I was rather worried that there wasn't much more story to tell. The original mini-series had a pretty strong concept and it had managed to tell a rather tight story. The whole curing of the zombie hordes was merely part of the setting - the core story was really about Kieren and the tale of his death and his return to life. But this second series was pretty phenomenal with so many different plot points going the same time. The show really upped the ante this time around by exploring quite a number of different angles that stem from the premise of the dead coming back. It took a while to build up, but the final payoff was pretty satisfying. Synopsis: In The Flesh is a BBC supernatural drama TV series created by Dominic Mitchell. The original mini-series had won the BAFTA for Best Mini-Series and Mitchell won Best Writer - Drama. The small community of Roarton seems to have taken a more welcoming stance to the Returned, Kieren (Luke Newberry) now has a job at a pub and he dreams of saving up enough money to leave town. But things are shifting in the political arena and the new pro-life Victus party is gathering support against those "suffering" from Partially Deceased Syndrome (PDS). Things really come to a head when Victus MP Maxine Martin (Wummi Mosaku) comes to Roarton and starts to influence the town. And the first thing that she manages to do is to implement a new "Give Back" program that has those with PDS now required to perform community service tasks in order to re-earn citizenship. In contrast we have Amy Dyer (Emily Bevan) coming back to Roarton and re-entering Kieren's life as his "Best Dead Friend Forever". But she's also involved with fellow PDS sufferer Simon (Emmett J. Scanlan), who is also a member of the Undead Liberation Army (ULA) that is fighting for PDS rights. But the ULA is escalating things with more violent demonstrations. And then we have Jem (Harriet Cains), Kieren's sister who was part of the militia that had previously hunted the undead. She's struggling to get used to school life and finds herself seeking comfort in those circles that still support staging patrols against the undead. There's quite ideological struggle at the core of this season as we have Victus and the ULA fighting a battle for public opinion regarding PDS rights. And it's hard to look at the Give Back program in a positive manner since it's pretty much just indentured servitude with no immediate guarantee that citizenship will be returned any time soon. As much as one could feel that PDS individuals do owe something to the community given the damage done while they were still full zombies, forcing individuals to do so in this manner seems a bit too much. The season eventually developed the angle related to Kieren's sexuality, which was a major plot point in the first series. The way it came back to life in this second season initially felt a little left field, but in the long run it was a fairly interesting part of the story. At first it felt like a bit of a struggle to keep up with everything that had been going on. Beyond the need to just remember what had happened in the first season, this second one made sure to introduce quite a number of new characters right off the bat and pursued things even further. And with the political angle and with different characters trying to work through personal trauma, there really is a lot going on. But it doesn't get overwhelming when you keep focused. I think one of the more complex story lines revolved around Amy, our little rebel of a zombie girl. Despite her relative connection to the ULA, she was never really presented as a significantly political character her. All of her revelations were very personal whether in terms of helping Kieran or just dealing with her lot in life. And given how her medication appears to be losing effectiveness with her, she ha quite the struggle indeed. In The Flesh really took things further and really tried to make the most of the little universe that had been created. It could have been a bit more polished at times and pacing could start and stop as well, but in the end it all worked out in a pretty interesting manner. Thus the second series gets 4 surprise zombie attacks out of a possible 5.